4-Pin to 4-Pin is more common from Video Camera to DVD Recorder or from Video Camera to FireWire (IEEE 1394) Hub. 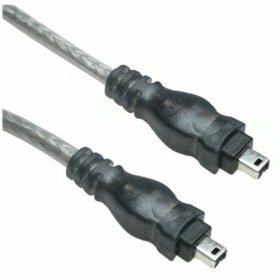 Connect your FireWire compatible Digital Video (DV) Camcorders,storage device,videoconferencing cameras, scanner, printers to your computer with this 3 foot FireWire cable. General Features: 4-pin to 4-pin – FireWire/1394/i.Link device cable – High speed data transfer speed -Supports IEEE 1394 transfer rates of 100/200/400 Mbits -Designed for high speed data transfer. FireWire is Apple Inc.’s brand name for the IEEE 1394 interface. i.Link is the Sony Corp. name for the interface. The IEEE 1394 standard: FireWire and i.Link is a high-speed serial bus developed by Apple and Texas Instruments — most commonly used for downloading video from digital camcorders to the computer. The first version of FireWire supported 100, 200 and 400 Mbits/sec transfer rates at a distance of 4.5 meters between devices. Almost all digital camcorders have included this connection interface since 1995. IEEE 1394b allows higher speeds at greater distances and was introduced in 2003.